Press the lower right corner on the touchscreen to access your climate control features. 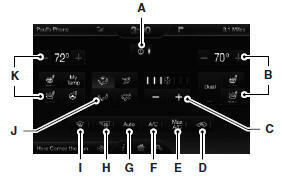 Depending on your vehicle line and option package, your climate screen may look different from the screen shown here. A. Power: Touch to switch the system off and on. Outside air cannot enter your vehicle when you switch off the system. B. Passenger settings: • Touch DUAL to switch on the passenger temperature control. • Touch + or – to adjust the temperature. • Touch the heated seat icon to control the heated seat. • Touch the cooled seat icon to control the cooled seat. C. Fan speed: Touch + or – to adjust fan speed. D. Recirculated air: Touch to turn the recirculated air on or off which: • May reduce the amount of time needed to cool down the interior. • May help reduce odors from reaching the interior. • Engages automatically when MAX A/C is selected. • May be engaged manually in any airflow mode except defrost. • May turn off in all airflow modes except MAX A/C to reduce fog potential. E. MAX A/C: Touch to cool your vehicle with recirculated air. Touch again for normal A/C operation. MAX A/C: • Distributes air through instrument panel vents. • Is more economical and efficient than normal A/C mode. • May help reduce odors from entering your vehicle. F. A/C: Touch to turn the air conditioning on or off. • Use with recirculated air to improve cooling performance and efficiency. • Engages automatically in MAX A/C, defrost and floor/defrost. • Outside or recirculated air. H. Rear defroster: Touch to turn the rear window defroster and heated mirrors. I. Defrost: Touch to clear the windshield of fog and thin ice. Touch again to return to the previous airflow selection. When on, defrost: • Provides outside air to reduce window fogging. • Distributes air through the windshield defroster vents and demister vents. J. Manual controls: Select any of the following airflow distribution modes: • Floor and Defrost: Distributes air through the windshield defroster vents, demister vents, floor vents and rear seat floor vents, and provides outside air to reduce window fogging. • Panel: Distributes air through the instrument panel vents. • Panel and Floor: Distributes air through the instrument panel vents, demister vents, floor vents and rear seat floor vents. • Floor: Distributes air through the demister vents, floor vents and rear seat floor vents. K. Driver settings: Depending on your vehicle and option package, you may have the following features: • Touch + or – to adjust the temperature. • If your vehicle is equipped with heated seats, touch the heated seat icon to control the heated seat. See the Seats chapter. • If your vehicle is equipped with cooled seats, touch the cooled seat icon to control the cooled seat. See the Seats chapter. • Touch and hold MyTemp to select a temperature you would like your vehicle to remember and maintain for you. • If your vehicle is equipped with a heated steering wheel, touch the heated steering wheel icon to warm the steering wheel. Note: If your vehicle is equipped with a wood-trimmed steering wheel, it does not heat between the 10 o’clock and 2 o’clock positions. 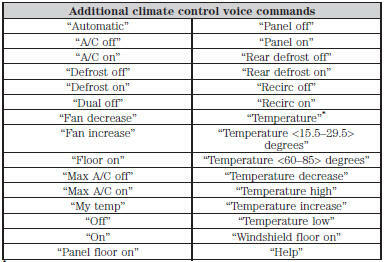 *If you have said “Temperature”, you can say any of the commands in the following “Temperature” chart.